happy december! this is a magical time of year. we spend time with loved ones, decorate our homes and make lots of delicious treats. 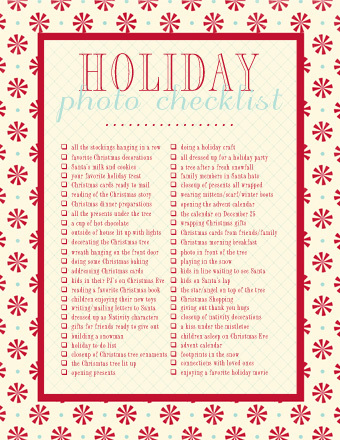 lets make sure we remember to take photos to document all of that holiday goodness, okies? here’s a checklist to help get your creative juices flowing, and to help you make sure you don’t miss recording one of those priceless holiday moments. don’t be confused, i did not create that list or make the cute downloadable option available on the interweb. but i linked up the gal that did. so, click, download, and start recording these glorious holiday happenings!